NATURAL HABITAT AND PREFERRED SITE: River birch grows naturally along creeks, in bottomlands and other wet areas and prefers moist sandy or loamy soil. It occasionally grows in standing water in bogs. River birch loves the wetlands of the Pineywoods and the Post Oak Savannah. It grows near running waters of rivers and creeks as well as beside the still waters of swamps, bays and slews. According to Benny Simpson, specimens have grown as high as 90 feet. 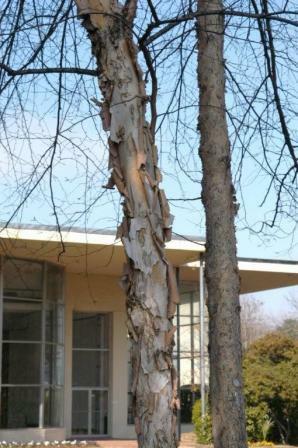 IDENTIFICATION INFORMATION: The most distinguishing characteristic of river birch is the bark, a dark red color that peels off in large sheets. FLOWERS AND FRUIT: Flowers bloom in the early spring before the leaves emerge. Male and female flowers are born separately and become winged nutlets about one eighth of an inch long ripening from April to June. BARK: The bark is a beautiful flaking material that may be the most distinctive feature of the tree. It is reddish, dull brown, peeling in curly, thin, papery strips. FOLIAGE: Simple, alternate, deciduous foliage with serrated edges. Lustrous dark green above, tomentose or hairy below. In most years birch has pretty good yellow fall color. 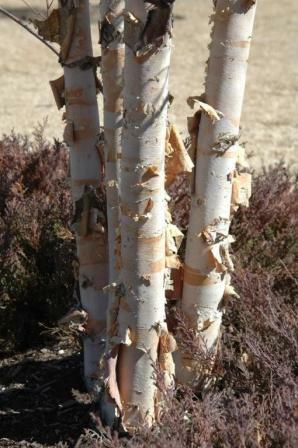 CULTURE: Birch is relatively easy to grow in most soils given enough moisture although the tree does not live very long. I don’t recommend it for a major tree planting. PROBLEMS: It has a short life and does not like the heat and highly alkaline soils in most parts of Texas. PROPAGATION: Seeds or cuttings. Seed can be sown in the fall or in the following spring after storage in cold temperatures of around 40 degrees for 30 to 60 days. Cuttings are best taken in late winter before bud break. 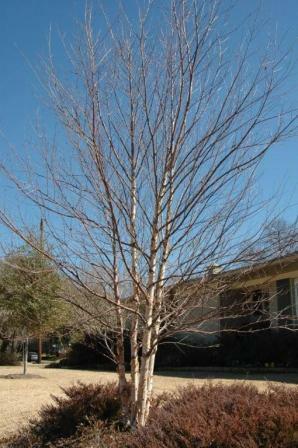 INSIGHT: River birch is a graceful tree, very good looking in the garden but does not live a long time.